The Anhinga is also known as the snake-bird for its habit of swimming with its body submerged in the water and just its long thin head and neck visible. Unlike cormorants that catch fish in their bills, Anhinga spear fish, flip them into the air and swallow them headfirst. This bird breeds in the southeastern swamps of the United States, and is a year round resident southward through Central and most of South America. 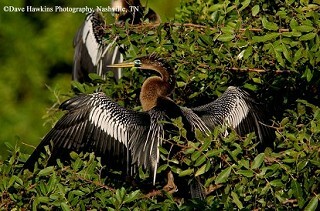 The Anhinga is a rare visitor and only occasionally nests in Tennessee. Description: The Anhinga is a large dark bird with a long S-shaped neck, a long pointed bill, and a long tail. The male is black with silver patches on wings. The female has a light brown head, neck, and chest, and a black body. In flight, the long neck appears headless and they often soar on long flat wings. Double-crested Cormorants have larger heads, shorter tails, shorter, blunter bills, and lack silvery wing patches. Cormorants do not soar like Anhinga's. Habitat: Lakes, rivers, and cypress swamps. Diet: Mainly fish, but also crayfish, amphibians, snakes, lizards, mollusks, leeches, and aquatic insects. Nesting and reproduction: Most all Anhinga nests found in Tennessee have been in colonies with other heron species in shallow lakes with numerous trees, especially cypress. Clutch Size: Usually 4 to 5 eggs. Incubation: Both adults incubate the eggs for 25 to 28 days. Fledging: Both sexes collect food and feed by regurgitation. At 3 weeks, chicks begin to leave the nest and perch on nearby branches. They take their first flights at about 6 weeks. Nest: The male begins and the female completes the bulky platform nest of sticks lined with fresh leaves and green twigs. The nest tends to be more compact than cormorant and heron nests. Status in Tennessee: The Anhinga is a rare but regular migrant and summer resident in West Tennessee, and a rare vagrant elsewhere in the state. Individuals arrive in late April and most depart by early September. Formerly more common with 50 to 100 nests at Reelfoot Lake in the 1930s. Observations of Anhinga in Tennessee have been increasing in recent years. It is currently listed as In Need of Management by the State of Tennessee. Anhinga, like cormorants have poorly developed oil glands, so their feathers aren't as waterproof as other water birds. It is common to see them perched in a tree with their wings open to dry the feathers. Another common name for the Anhinga is water-turkey, referring to their long fan-shaped tail. Anhinga may build new nests, use old nests, or appropriate a nest newly built by a heron or egret. When trying to appropriate an occupied nest, Anhinga will often eject the eggs of other species. At about 2 weeks of age, young will leap from the nest into water if disturbed and then climb back into nests when the danger has passed. The oldest known Anhinga was 11 years, 11 months old. Best places to see in Tennessee: Reelfoot Lake and other wooded swamps in West Tennessee. Frederick, P. C., and D. Siegel-Causey. 2000. Anhinga (Anhinga anhinga). The Birds of North America, No. 522 (A. Poole and F. Gill, eds.). The Birds of North America, Inc., Philadelphia, PA.